Body bags sadly aligned on the deck of the Bourbon Argos. With feet in the fuel, sour air, our team has been retrieving the bodies of 29 people killed by fuel exhalation, drowned in gasoline and salty water. They found them after rescuing 107 persons from an overcrowded rubber boat. They were lying on the bottom of the boat, hidden below a deadly layer of fluid. It took them 3 hours to retrieve all corpses as the conditions were difficult and risky. From the same boat 23 severely burned people were saved. Once you have seen chemical burns from fuel and salty water you will never forget it. As migrants travel in overcrowded boats, those who sit in the center have their feet, legs and genital area soaked in that terrible fluid slowly burning their flesh. Two persons were so severe that they had to be evacuated to Italy by helicopter, other five by speed boat, included one who our doctor had to intubate on board of the Bourbon Argos. The past days have been dreadful at sea. Rescue teams have been reaching out for boats in distress continuously. 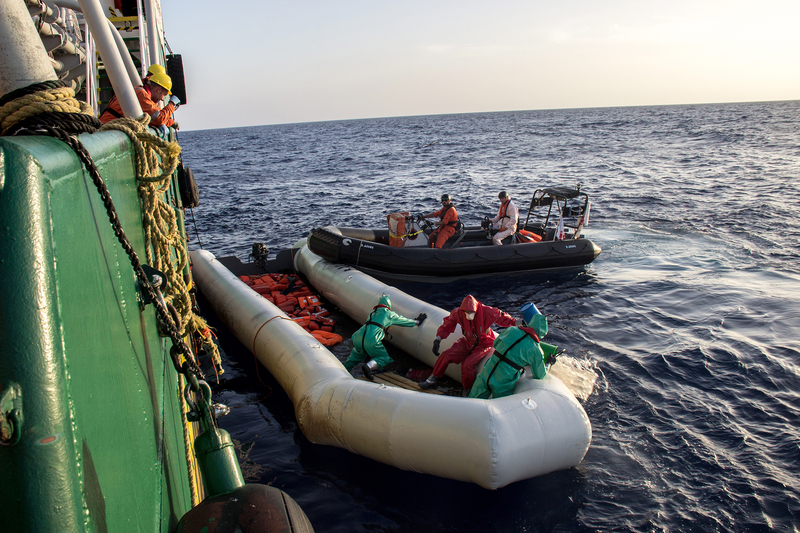 MSF has been at sea for many months now, together with other NGOs, and rescued thousands of people from drowning, but the restless work was not sufficient to save the lives of more than 3900 people who have died at sea since 2016. I’m haunted by the images of people dead at sea. Bodies made heavy by their clothes soaked in salty water. Water filling their mouths. Water swelling their bodies, erasing from their face the last grimaces of pain. No one to hold their hands in their lives’ last seconds. Nobody to caress their faces after death. Nobody to recompose their bodies. No relative to bury them. The sea has become a cemetery of water but only few seem to care. After years we fail to find a new way to describe the complex phenomenon of “boat people”. We fail to draw attention on a daily drama occurring in the Mediterranean sea. A vicious circle of populistic speeches, atavistic fear of the other, dread of invasion and appeals for the creation of safe and legal passages that seems to lead nowhere. Walls, tighter control of frontiers, deportations, deals with third part countries to keep people in need of protection away from seeking refugee seem to be the only measures our political leaders can think of. In the meantime, the tragedy repeats almost daily, for years, with no interruption. Ten years ago, I started working with MSF in Lampedusa. There were three of us in the team: a coordinator, a nurse and me. Available day and night, we were ready to respond at any time to an imminent landing. We spent hours, often at night, at the dock, scanning the horizon, waiting for desperate sea travelers. From those months in Lampedusa I always with me the eyes of the people, lost and desperate eyes that brightened when their owners set foot on the ground and when there was someone there to reach out to the dock to welcome them. I remember pregnant women, the cases of hypothermia and burns and the pregnancies result of rapes. I remember the humanity in the gestures of the rescuers and the confusion among the people sat shivering next to each other at the pier, waiting to be transported to the reception center. My mind returns to the cemetery of Lampedusa, where unnamed bodies lie - people who put their lives in a precarious boat, risking it all. For those lost in the Mediterranean, like unnamed victims lost in any war, somewhere in the world someone is waiting for news, a sign , a call. But only silence resounds. And by that silence I’m haunted.